Written by Andrea Morisette Grazzini. Posted on 30 May ’10. Filed under Academic & Research, Education Policy, Politics & Elections, Standard Measurements. Bookmark the Permalink. Both comments and trackbacks are currently closed. 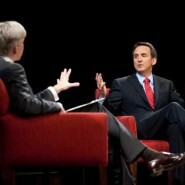 Minnesota Governor Tim Pawlenty appeared on this week’s edition of NBC’s Meet the Press. The clip was taped Thursday when NBC News anchor David Gregory came to Minneapolis to moderate a hour-long discussion with Pawlenty, coverage that implies he’s one to watch for a 2012 Presidential run. Pawlenty deferred declaring his candidacy, but did demonstrate his considerable rhetorical skills, smoothly navigating Gregory’s runs at his controversial positions while simultaneously warming up would-be voters with snappy sound-bites. Such as christening “common-man” identities like “Sam’s Club Republicans” and inciting populist passions by citing social movements like The Tea Party for having the necessary “creative energy for the next generation” of government. No doubt Tea Party tactics turn media pundits and policymaker’s heads. But whether their polarized ideological agendas reflect the actual ideals of real people, however, remains a critical question. Pawlenty also wove in linguistical inferences which play well in educated vernaculars, like those of academics who attended the event, which was sponsored by University of Minnesota’s Humphrey Institute. Including the term “high order government,” necessary, he said, for prioritizing a sustained “turn-around” of US policies. And an antidote to what Pawlenty referred to as the “phony effect” of the Obama administration’s economic stimulus package, which has produced, he acknowledged, “near-time” economic gains. “It’s simple math” Pawlenty explained, suggesting his Jr. High daughter has a better grasp of macro budgetary issues than Democratic leaders do. He went on to defend his rejection of federal education funds in favor of performance pay for teachers using standardized testing methods to measure results. Pawlenty’s demeanor touched audience member’s nerves. “You carry yourself as if you’re the only adult in the room,” said one, calling Pawlenty out for his apparent distain for people who don’t agree with his policies. Triggering impassioned exchanges like these make for attention-getting press, a fact of which politicians like Pawlenty are well aware. But long-term proof shows they are effective for producing little more than further polarized political positions. His statement resonates with research implicating political upheaval as a key factor fueling “a sense that society has lost its way.” And showing nearly 90% of Minnesotan’s don’t trust government, data outlined in a recent report by Humphrey Institute’s Center for the Study of Politics and Governance. Such indicators should sound the alert for the critical importance of “higher order thinking,” an education term referring to advanced knowledge that transcends rote repetition of one-dimensional facts. Such thinking requires the employment of analytical, evaluative and creative abilities that seek and find connections between diverse concepts to synthesize effective solutions. A key characteristic of higher order thinking is the ability to reflect on critical questions that trigger deeper understandings of complex issues and isolate the most authentic and accurate answers to them. How can creative energies be employed to overcome deficits of thought which incite people’s lower order impulses? How can leaders stimulate the next generation of government to prioritize the kind of common wealth corrosive discourse has failed to achieve? How can authentic public leaders raise the standards of achievement for the pro-social skills we should have all learned when we were in Jr. High? Andrea Morisette Grazzini is the founder and co-leader of DynamicShift. I like your style and open mind. Current Politics reminds me of simple, yet formal approaches to ‘Problem Solving’. Twenty years ago I was in corporate world classes to instruct us in processes developed to Problem Solve for profitability. About the same time I found many of those charts and techniques being taught in my daughter’s Apple Valley Grade School. The first step was always ‘clear definition and verification’ of the problem. Do we have a generation in power who failed to learn these basic skills? To me the answer to your question is, “take time to co-own values”. Functional families pro-social skills are developed over the years into right behavior, right attitude, and right relationships on the part of each participant during discussions at mealtime. These values become co-owned by the Jr, High child by discussing his or her question, “Why?”. Since your emphasis is on government, we need a definition of values. Values are cherished ethical beliefs and principles that underlie, guide and transcend the way an organization does what it does. Thank Andrea for the wonderful job you are doing. I wish a lot of people knew about your website. It is uplifting and positive. I love the articles and how you have news from all kind of walks. Please keep up the good work to bring people together. Now days there is this fear that new comers and certain people are taking over and instead of seeing each other as a threat, we need to come togheter as a whole community and we need to invest in the future so everyone has higher education; with education comes understanding and tolerance. we are all here for a reason and everyone will make this country a better place for all of us. Thanks again for being so friendly at YMCA to everyone!